As a cat owner, I handle feces regularly. Handling feces is gross. Many cat owners are also not super-crazy about handling a whole bunch of feces, so we sometimes talk to each other about ways that we can minimize the feces-handling. Today someone linked me to a brand-new "best litterbox ever," this one a Kickstarter sensation that has gone on to be well-liked by a number of people with small furry purring poop machines in their house. It looks problematic to me, but it also reminded me that I have never encountered a decent "better litterbox" than a big tub filled with some sort of medium, into which the kitties crap. I only had one truly horrendous experience, with the CatGenie. This happened five years ago, and I have no idea if the fine folks at CatGenie have upped their game, so take this with a grain of salt and don't use it (entirely) against them. The first, say, five months I had the CatGenie, it worked as it was supposed to. It consists of a rotating bowl, a bunch of plastic granules which serve as the litter, a raising and lowering scoop-like spatula, a hopper, and a flusher. It's hooked to a hose and a drain. When a cat craps in the box, the intention is this: The spatula lowers, the bowl rotates; the turds are captured in the spatula, letting the granules through. The spatula raises, dumping the turds into the hopper, where they're washed down the drain and whisked out to sea. The hose flushes water into the bowl, where the plastic litter is rinsed. Then an air-dryer dries the granules, and it's ready for the next cat-crapstravaganza. I'm not sure if this is something I'd be better off calling in about than emailing you directly, but here goes. I'm at my wit's end with the CatGenie. Thanks to your help last month, and the shipment of two different main unit replacements, I've gotten the CatGenie to a point where the bowl rotates the whole time without stopping (instead of pausing for long periods of time where nothing happens), the air blower does in fact dry the granules (instead of leaving a pile of soggy plastic bits), and the arm does raise and lower effectively when the main processing unit tells it to (instead of staying up or down the whole time and accomplishing nothing). The problem I'm having now is, frankly, awful. 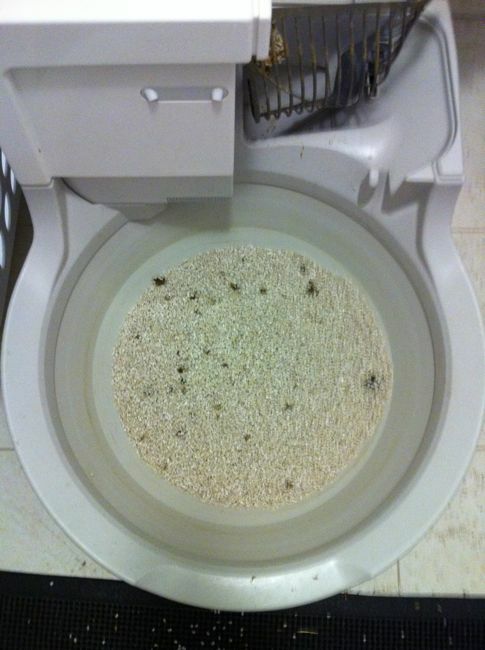 Instead of scooping up the cat turds, dropping them into the hopper, and flushing them, the CatGenie seems to be basically straining the turds through the scoop by breaking them into chunks small enough that the scoop is unable to effectively pick them up. Then, after breaking the turds up, failing to scoop them, and leaving them mixed in with the granules, the CatGenie blows hot air over the tiny turd chunklets, filling my house with the rancid, disgusting smell of hot feces. So when I get home from work, or when I come downstairs in the morning, that is what greets me. I am including a photo of the CatGenie immediately after having run a cleaning cycle. The dark bits are the turd chunklets. You will notice also a massive wad of poo on the arm itself, where it has mashed a turd into the bottom of the bowl and then tenaciously clung to it, which is also not an uncommon phenomenon. Usually when this happens I use a paper towel to remove the turd-wad from the arm. I use the same paper towel to pluck out the turd chunklets and manually dump them into the hopper. All of which seems to go explicitly against the reason I got a CatGenie in the first place, which was so that I would rarely have to handle cat poo. Honestly, I can't think of anything that would make me not want to go back to a nice, civilized, covered catbox with scent-dampening clay litter, throw this thing into the dumpster, and warn everybody I know about the failure of the CatGenie to function. However, I now present you, Rich, with an opportunity to change my mind, present a solution to this seemingly insoluble never-ending series of problems, or otherwise alleviate my utter disappointment with your product. I never heard back. In all honesty, I was at my wit's end with the thing and could not foresee any possible solution. In my furious insanity, I deliberately wrote this letter in as provocative and florid a manner as I could muster. I imagined that the people at CatGenie would read it, laugh, and offer a full replacement as a solution, instead of what happened, which was nothing. I am not angry at the CatGenie people, at this point, because their product was fundamentally flawed, and they must have been inundated with complaints from people like me. Many of the complaints must have been much more vocal about their hatred of the scent of fresh-baked turdlets waking them up in the mornings (I have always maintained a policy of being even-tempered with Phone Helper People, because I have been on the other end of that phone). They did what they could with what they had. I'll stick with a big tub full of a granulated medium that can accept whatever my cats dish out.